The pent up demand for spacious new stores in Galway is finally to trigger a further round of construction activity. The new owners of the Gateway Shopping Park at Knocknacarra on the western suburbs of the city are to spend more than €20 million on a second phase of the park which will include an additional 11,148 sq.m (120,000 sq.ft) of retail space to accommodate between eight and 12 new traders. The extension, due to be completed in 2018, will bring the overall retail space to more than 29,729 sq.m (320,000 sq.ft). The planned extension will also include Grade A office accommodation extending to 3,344 sq.m (36,000 sq.ft). The Gateway was sold by Nama last year as part of the Hazel Portfolio which also included the high value asset Wilton Shopping centre in Cork and Drogheda Retail Park. A joint venture involving Clarendon Properties and US hedge fund York Capital Management bought the €120 million portfolio and subsequently sold on the two retail parks for more than €50 million to Targeted Investment Opportunities (TIO), a low profile group which invests in the Irish property market through specialist sub-funds. TIO has now acquired assets with a gross development value of more than €1 billion including seven retail parks with more than one million sq ft of buildings and 50 acres of development land. It is also committed to developing several office buildings in Dublin and various residential schemes including a flagship Public Private Partnership at Greystones Marina Village. The Gateway park is already producing a rental income of €1.4 million per annum and is managed by Sigma Retail Partners, a specialist company set up by retail adviser Marcus Wren. TIO is chaired by Justin Bickle, the managing director of Oaktree Capital Management, which also serves as investment manager, along with four other experienced directors, John Mulcahy, the former JLL chief executive and Nama executive, Barry O’Leary, the former chief executive of IDA Ireland; Jim Bennett of the Mullingar-based Bennett Construction and the financial services adviser Anthony Noonan. The Galway park was developed around 2006 by property veteran Michael Whelan. It has considerable advantages over most out-of-town shopping centres because, like Childers Road Retail Park in Limerick and The Park in Carrickmines, it has planning approval for open use retailing. 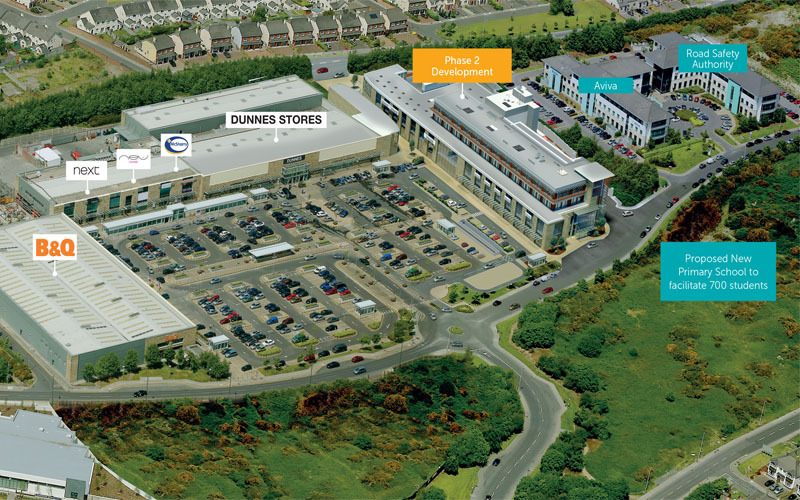 This has allowed it to accommodate a large Dunnes store outlet as well as B&Q, Next, New Look and McSharrys Pharmacy. Apart from this valuable planning consent, the grounds of the Gateway centre includes a 3.94 acre adjoining site which is now to be developed and a further 5.45 acres alongside the entrance which is also commercially zoned. More than 100 workers are expected to be employed on the construction phase with an additional 400 jobs likely to be created when the new shopping facilities have been completed. Darren Peavoy of Bannon estate agents, who is marketing the planned new buildings on behalf of Sigma Retail Partners, said they had already received a large number of inquiries from both national and international retailers, many of them with long-standing requirements for trading opportunities in Galway. He said it was quite evident that Galway had been under served by international retail brands by comparison to other cities.